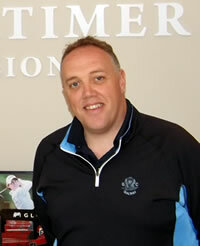 David Mortimer is the PGA professional at Galway Golf Club. David is a PGA Cup player and is a two-time Irish PGA champion (2006 & 2010) and a British PGA Professional Champion (2010). David has recently become a member of TGI golf, the UK and Irelands largest golf professional buying group with over 400 members. TGI golf gives members the edge against the high street discount store. We constantly monitor prices to give the best value for money to all our customers. The Pro shop at Galway GC stocks all the leading brands in clubs and clothing. Titleist, Taylormade, Callaway, Ping, Mizuno’ Footjoy, Adidas, Glenmuir, Oscar Jacobson Rohnisch Pro-quip and Ashworth. (Crested and non crested). Competitive Prices and Trade In’s welcome on all clubs. Please don’t hesitate to ask for our best price, we will do our best to match any price.